Dad Hilariously Shows Us How To Put A Baby To Sleep. If your baby just isn’t sleeping through the night, you’re probably beginning to feel pretty desperate. Getting your baby to fall asleep can be the crowning achievement of your day, and many parents find creative ways to achieve the blissful moment when their baby closes their eyes. Sleep and all its intricacies is one of the most common complaints from new parents – why isn’t my baby sleeping? Sleep deprivation can affect both parents and their new babies. 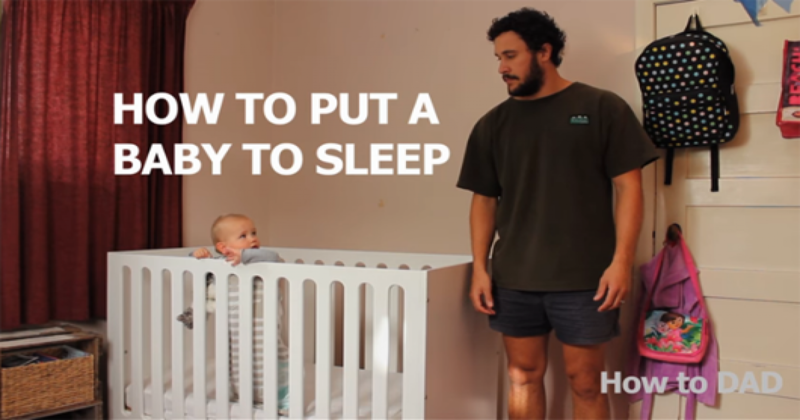 But this father has shown some awesome tricks to get her baby to fall asleep. It also a fun for both. This dad knows the struggles of trying to put a baby to sleep all too well. Here in this video you can see, the baby is falling on the bed to sleep when his father tells him to go to a nap. But it is not clear to us who is foll. Father is telling but the clever baby is acting. I think these acting make his father fool. And when he gives others some funny advice, you’ll be cracking up in no time.